Find the reveal post here! 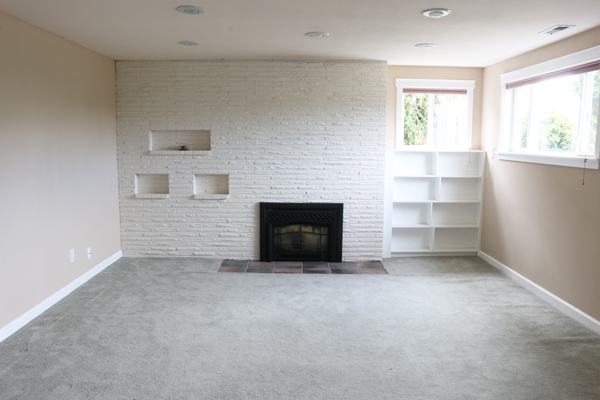 One of the things we really liked when we looked at our house for the first time was that it had a bright and light-filled finished basement. Usually the houses in our price range in Seattle were super small, dark, cramped or had too low of ceilings to feel like actual rooms. While this is a modest house, a light-filled lower level was a big plus in making the house feel more spacious and functional overall. 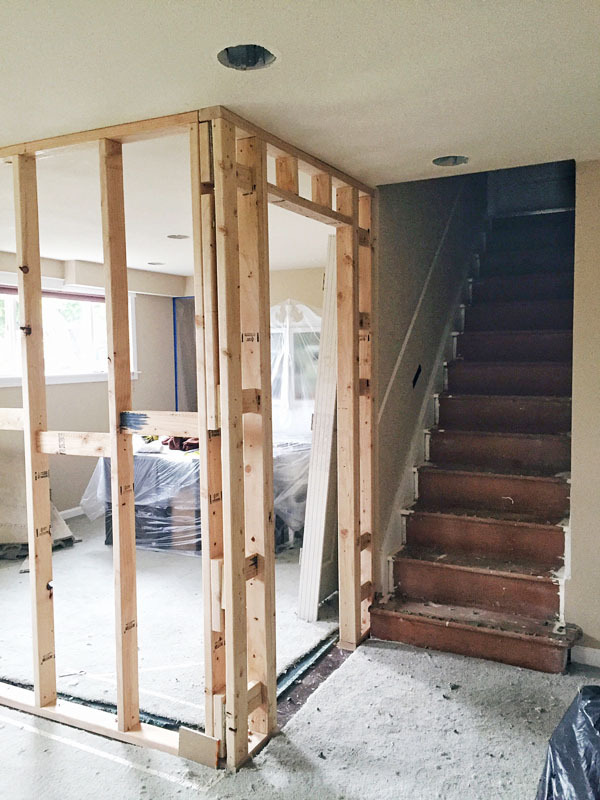 When I last shared an update on this space late last summer, we were just building a wall to create an office in the big room. Well, to be clear, WE weren’t building the wall. Contractors were. 🙂 The open space downstairs was quite large, but we decided it was almost too large to be useful. Open floor plans can be great sometimes, but other times they just aren’t as practical. Since we needed another room, we decided to divide the one open area into two separate spaces. I’ll share more about these rooms in future posts. But we are very glad we divided up the space! It’s made a big difference in the functionality of the entire lower level and it almost feels bigger now than it did before. So after the walls were painted (we don’t necessarily have a long term plan for the wall colors in our lower level, but fresh paint helped clean things up for us in the meantime), we were excited to move on to some new flooring. The carpet in this room had seen better days. The carpet was actually covering up old asbestos linoleum tiles. Our inspector let us know when we bought the house that it was important that we not tear the original flooring out or leave it exposed. It needed to be left undisturbed but could be covered safely with the new flooring. If you’ve been following the blog for awhile you might remember that a few years ago I partnered with Mohawk to install pre-finished Hickory wood floors in our old house. We absolutely loved our Mohawk flooring, so we were pretty excited when the opportunity came up to partner again in this house! 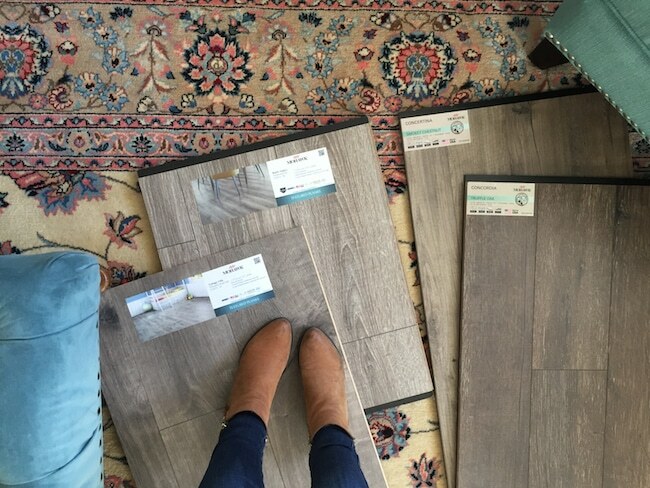 When we bought the house, we started dreaming of the type of flooring we’d want. We knew this needed to be a super dog friendly space (now that we have FOUR dogs who would be playing in this room! Leo and Bella live with my daughter Kylee, but often visit Jack and Lily for doodle playdates). It needed to be able to be installed over the old flooring, too, so that was another deciding factor. After exploring our options, we decided a quality laminate flooring would suit our needs the best. We looked at quite a few samples trying to determine just the right wood tone and feel for our home. 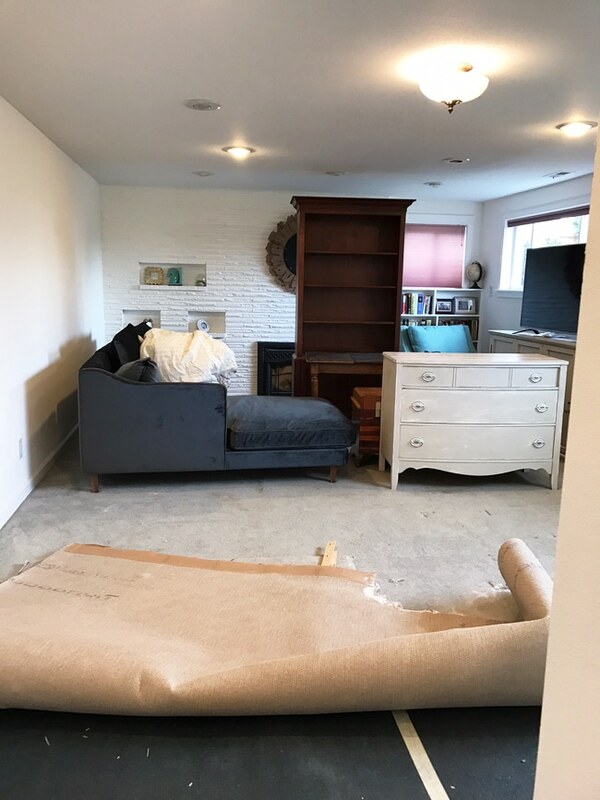 We brought samples all over the house to make sure they felt right with existing flooring (as well as any future plans for refinishing existing floors or new floors elsewhere). While they were not going to be installed next to any other flooring (except the lower level tile in the hall and on the hearth), it was still helpful to think about how these floors would fit into the overall design of our home. 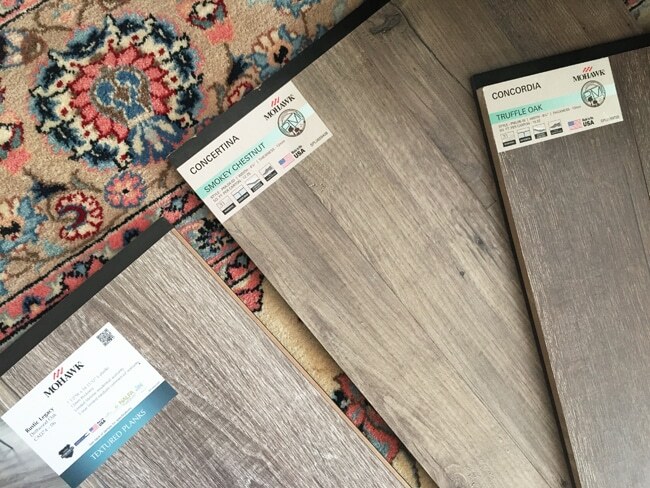 All of the samples we tried were beautiful, but we fell in love with the Concertina flooring in Smokey Chestnut. We were so impressed by this flooring. It has a matte finish, texture and coloring that feels really natural and realistic. About a week before Christmas the installers came to remove our carpet and the next day they started and completed the installation process. Yes, it was completed in ONE DAY! I was thrilled. Fortunately they were very accommodating in helping us move our furniture around, since we weren’t able to move it completely out during the install! 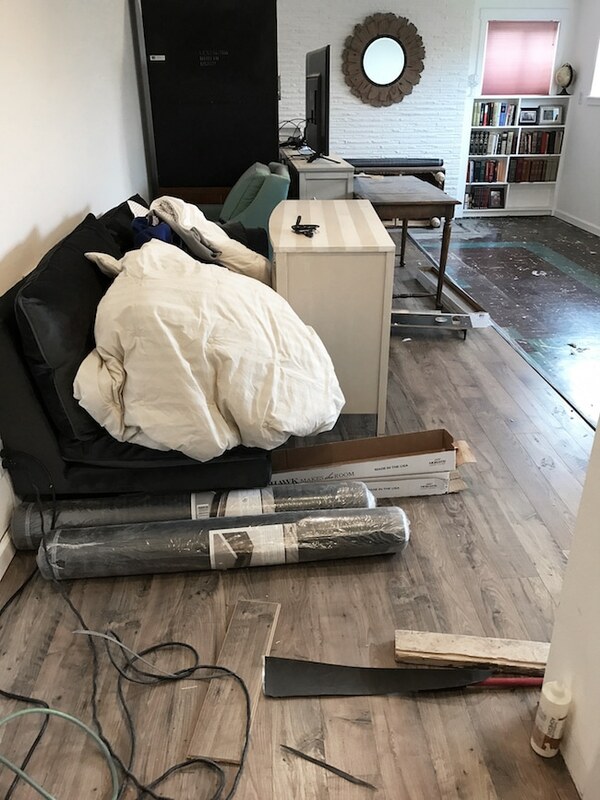 Pre-finished flooring (like we had at our old house and now this new flooring) doesn’t create as much mess or disruption to life as flooring that has to be finished on site. I have to say, the flooring completely transformed the downstairs in so many ways. It feels cleaner, warmer, and makes our whole house feel larger and much more updated. Click to see the full reveal of our new flooring here (and then stay tuned for the upcoming reveal of our office flooring, too)! 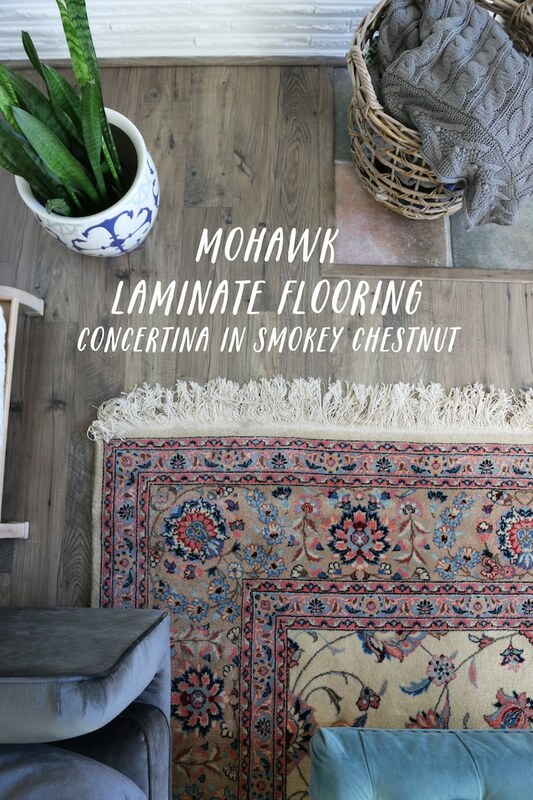 I wrote this blog post while participating in the Mohawk Flooring Blogger Campaign and received flooring for my family room to facilitate my review. To see this blog post in its entirety, visit The Inspired Room here!